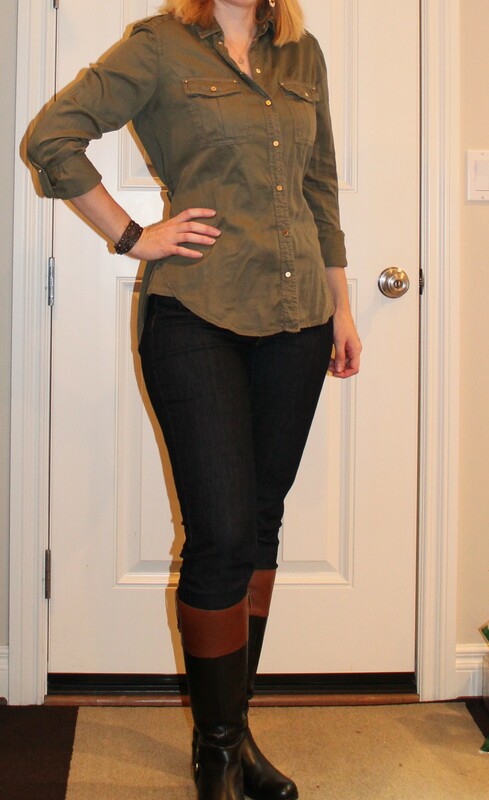 Today I decided to dress up a bit more than usual since I’m going out to a movie after work with my hubby. 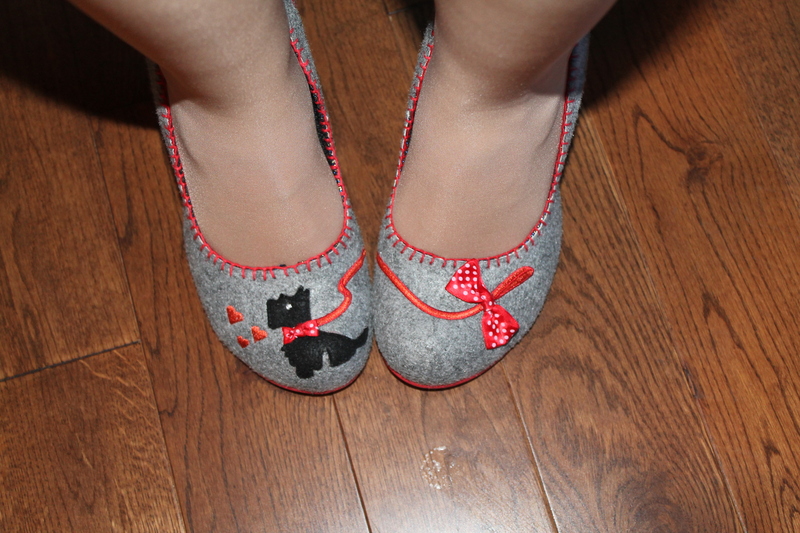 I paired this stretchy red pencil skirt with a black heart print blouse and a pair of adorable scotty dog shoes. I’ve had these shoes for years but never had a chance to wear them until now. And here are a few other outfits I put together this week. 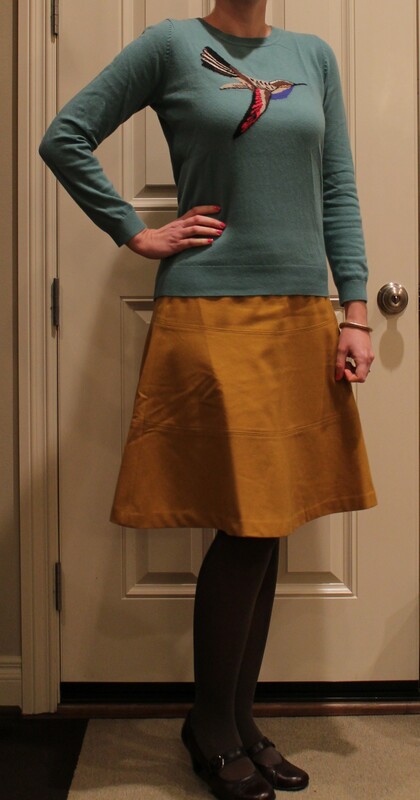 This is a sweater and skirt I got from Boden and had been waiting for an opportunity to wear. The skirt is my favorite color and I love the fit and pattern of the sweater. This is a wrap top I got in my last stitch fix, and I’m wearing it with a necklace I made from “For the Makers”. The top was an interesting piece and I’m glad it made it into my last fix. 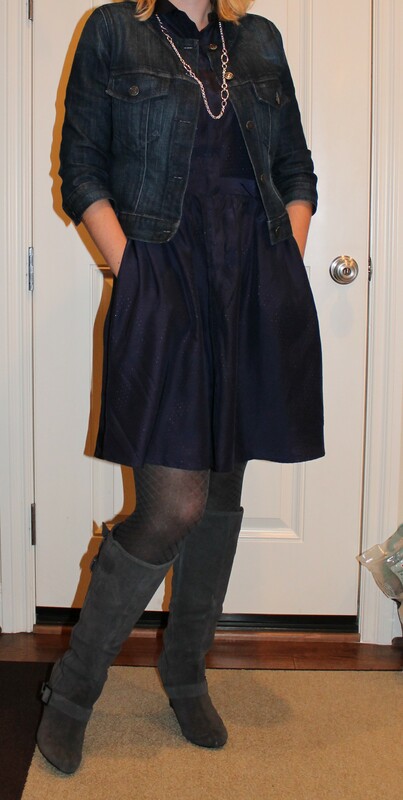 Today I broke out the tights for the first time this season and wore a new dress from Target paired with my jean jacket and some new diamond print tights from Old Navy. I love these boots because they keep my legs nice and warm. The dress is awesome because it has pockets and long sleeves if I take the jacket off. Keeping with my mustard theme, my quest for mustard jeans has finally come to an end. I’m not super thrilled with the fabric of these (a little too polyester feeling) but they fit okay in the waist and the color is pretty nice. They are a brand I’ve never heard of, but I found them online when searching for mustard skinny jeans. 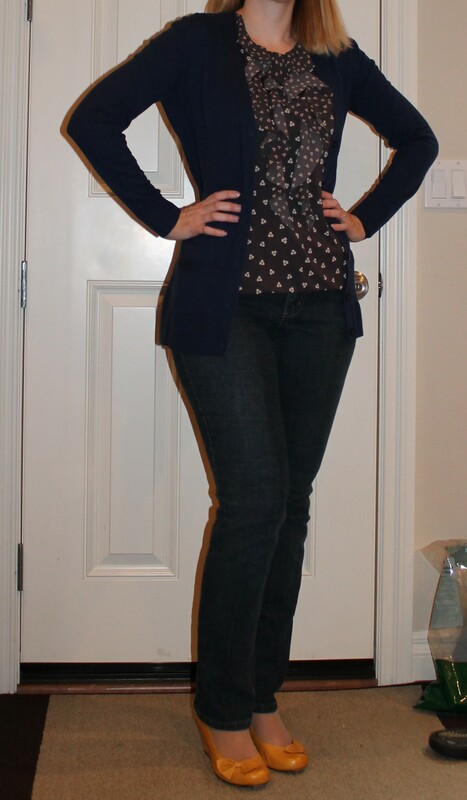 I paired them with a top and necklace from stitch fix. I have to wear them with boots since they are boot-cut and long, which I don’t love since I like flats better, but still glad I was able to find them. Mustard is my favorite color to wear, and I tend to pull it out more in the fall. 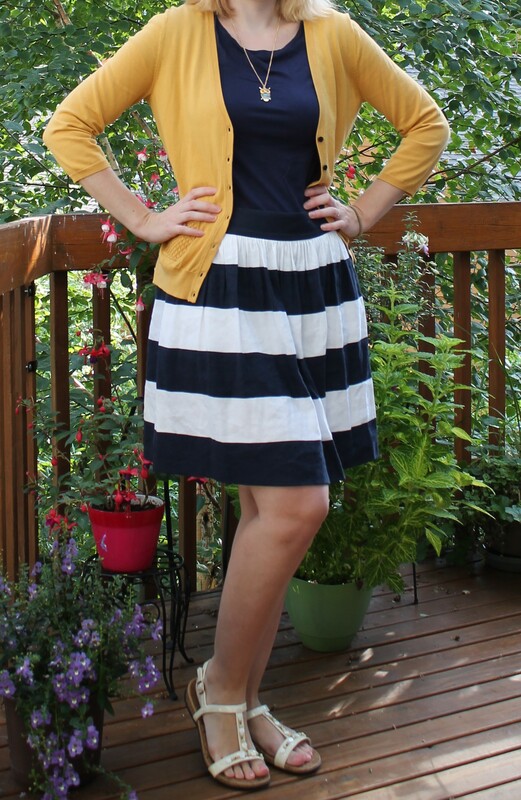 Today I wore this mustard sweater from H&M with my striped skirt from Banana Republic. I also wore my new owl necklace I got at Old Navy this weekend, which is super cute with mustard and teal accents. 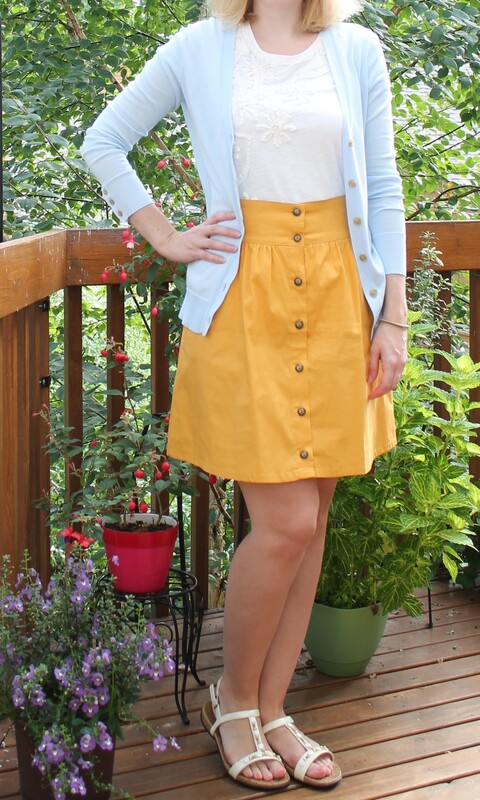 I was able to get one last sunny outfit in last week with this mustard colored skirt from ModCloth and an older embellished Tee from JCrew and cardigan.